Sofy.tv is a live streaming movie platform that is specifically focused on short films. The site was launched during the 2018 Cannes Film Festival by a group of film buffs from Largo Films. To date, the site features a catalog of 250+ films and counting. New films are added every day, meaning that you will never run out of great shorts to watch. The platform gives film lovers everywhere the chance to access award-winning shorts from all over the world. New users simply need to sign up (see how below), and use the sites powerful search features to find the films they want. Users can search by film name, director, genre, country of origin, and many other variables. In the blink of an eye, the site will show every relevant film that matches the search. Alternatively, users can browse the new releases, popular films, or featured pages to find movies. Each movie will appear with a brief story description and details about running time, genre, and country of origin etc. When they have found what they are looking for, users only need to click the play button and start watching. The best and most cost effective way to enjoy the Sofy.tv experience is to take out a subscription membership. Given their catalog is now over 250 films, this free works out to roughly 2 cents per movie. Sofy.tv is great value for money and about half the price of the Netflix standard plan which starts from $9.99 to $10.99 per month. Once users have signed up to the Sofy.tv subscription plan, they will have unrestricted access to all the movies on the site. Right now, Sofy.tv is offering the first months membership entirely free for anyone who signs up for a subscription plan. For those film enthusiasts who either want to try out Sofy.tv or just want to access a particular film, there is the pay as you go option. Users can pay a small fee, just 1.99 per film, to watch any movie they like. While the vast majority of users opt for the monthly subscription plan, being able to pay per film is a really great option for those select people who need such a service. The good people at Sofy.tv have ensured that the entire process of signing up to the platform takes less than a few minutes. To do so, simply head to the Sofy.tv website and click the “Subscribe Now – Get a 30-day Free Trial” button in the center of the homepage. 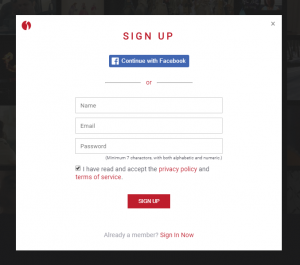 You will then see a pop-up box that invites you to create an account with them. The fastest way of doing this is to sign up with your Facebook account. If you don’t have a Facebook account or don’t wish to sign up this way, you can simply fill in the required details in the box to create an account. Once you have finished these steps, you will notice that you are now a member of the site. Your account name will appear in the top right of the screen and the site’s specially developed AI system will have jumped into action. From now on, Sofy.tv will begin to personalize your experience by suggesting relevant movies based on your past searches and viewing habits. Now that’s pretty cool. One small step remains before you are completely free on the site to go crazy watching short films. After you have registered your new account with Sofy.tv, you will need to set up your preferred payment method and decide whether you want a subscription membership or to pay as you go. To do this you can either click the “Start 30 Day Trial” tab which is located in the center top part of the homepage, or you can click on a film as if to start viewing it. After you have done so, you will see three options pop up appear. 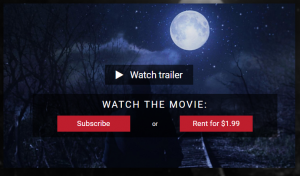 You can choose to watch the trailer, subscribe, or watch the movie for $1.99. The $5.99 plan is billed monthly and allows you to watch one movie at a time. The $4.99 plan is billed yearly and allows users to watch two films at one time. Why Pay For Sofy.tv When Other Sites Are Free? It is true that you can access short films for free on sites like YouTube and Vimeo. Paid sites like Netflix do have some short films too. So why pay for Sofy.tv? In order to answer this, you need to look at the benefits that Sofy.tv has to offer. To start with, it is a site that is dedicated to short films. Not only does this mean that users will find loads of great short films on the site, but also that they have been screened to make sure that they meet the high standards of excellence demanded by Sofy.tv. Another reason to choose Sofy.tv is that for every film watched, the site pays the filmmakers money. This helps to ensure that filmmakers are at last getting paid for their hard work, something which will ensure a much healthier short film industry in years to come. Finally, free sites such as YouTube include advertisements before and sometimes during films. For any passionate film lover, there is nothing worse than having their viewing pleasure interrupted by an advert for children’s diapers or for some new shampoo. Must I continue? Sofy.tv offers the best possible viewing experience at the best value. So if you are a short film lover, click this link and join the Sofy.tv short film revolution today.